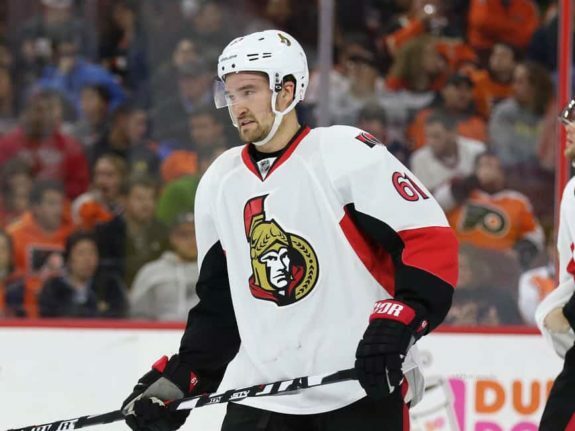 Mark Stone could end up getting one of the biggest pay increases during the NHL off-season, but will it come from the Ottawa Senators? Through four seasons in the nation’s capital, Stone has been one of Ottawa’s most consistent forwards and has exceeded expectations for someone who wasn’t drafted until the sixth round in 2010. He’s also coming off his best season yet in which he surpassed the point-per-game mark for the first time in his career. Considering last year’s production, his current contract, with an average annual salary of $3.5 million, was a bargain. This summer, it’s expected the Senators will have to pay more than double that salary in order to keep him in the fold. What Are the Senators Getting From Stone? Still in his prime at the age of 26, Stone has recorded more than 60 points in all but one season since becoming a full-time Senator in 2014. His most recent season was cut short by a leg injury, but he still managed to tie Erik Karlsson for the team lead in points with 62 despite missing 24 games. As well, he had a team-high plus-nine rating, an impressive total considering the Sens finished second last in the league. 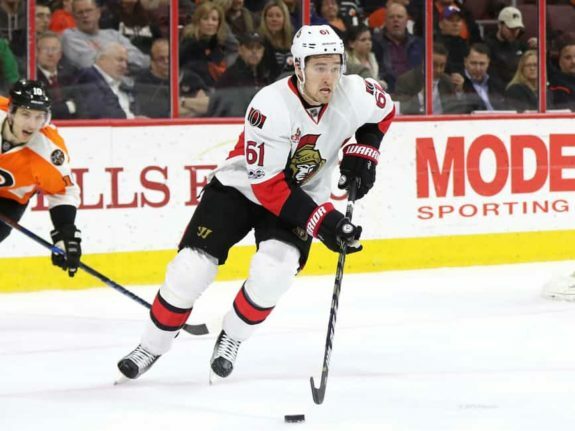 He may not be as quick or skilled as teammate Mike Hoffman, who has similar statistics in his time as a Senator, but there’s a lot to like about Stone’s game. He has grown into a solid two-way player who can contribute on any team’s top two lines. Early last season, Sportsnet’s Luke Fox had high praise for Stone, calling him the most productive RFA of his class. If the Senators can’t re-sign Karlsson this summer, Stone could be a leading candidate to fill in the vacant captaincy. He’s clearly held in high regard in the organization because of the versatility he brings. Stone’s second contract with the Senators is coming to a close. It’s a bridge contract that paid him $10.5 million over three years, including $4.5 million through this past season. General manager Pierre Dorion and company have made it clear that figuring out the Karlsson situation is their top priority over the summer, but locking up Stone should be a close second. It will no doubt take a boatload of cash, but Stone also indicated near the end of the season that he’d need to be convinced the team is heading in the right direction before he commits to anything long term. Mark Stone went on to say: "I'm going into the summer wanting to stay with this (Senators) team." And he also added, "it feels like we're going in the right direction." Will Other Teams Put Forth an Offer Sheet for Stone? As mentioned, there is no shortage of teams that could use a forward of Stone’s calibre, but he’s not going to come cheap. Any GM who puts together an offer sheet for Stone can expect to sacrifice at least three draft picks. Sportsnet’s Rory Boylen explains how offer sheets work and the compensation teams will have to match if the offer is accepted. Under the requirements for the 2018 off-season, if the annual average value (AAV) of the contract is greater $8,118,642, the team that submitted the offer sheet will have to give up two first-round picks, a second rounder and a third. If the AAV is greater than $10,148,303, it will cost the team its next four first-round picks. Generally speaking, teams usually avoid offer sheets because of the sacrifice involved when it comes to draft picks and because it inflates the market for teams looking to come up with a matching offer to keep their restricted free agents. A perfect example is the feud that developed in 2007 between general managers Brian Burke and Kevin Lowe when Lowe, then with the Edmonton Oilers, swiped Dustin Penner away from the Anaheim Ducks. In recent years, well-documented offers were presented to Shea Weber and Ryan O’Reilly, but they both stayed put as the offers were matched by the Nashville Predators and Colorado Avalanche, respectively. As for determining how much Stone would be worth, it’s tough to pinpoint an exact amount, but the Ottawa Sun’s Ken Warren took a crack at it in March when he compared Stone to Evgeny Kuznetsov and Ryan Johansen, both of whom were restricted free agents last year and had similar statistics to Stone. All three players were born in the same year as well. Kuznetsov and Johansen stayed put last summer, signing eight-year contracts with AAVs around $8 million. Signing Stone may not be as simple as offering him enough money, which many people wonder if owner Eugene Melnyk since he has a history of being stringent as far as the salary cap goes. There’s also other contracts to consider, including Karlsson, Matt Duchene (set to become an unrestricted free agent in 2019) and Cody Ceci and Frederik Claesson, both set to become restricted free agents this summer. The Senators’ cap hit is currently $60,375,833 and eight players are up for contract renewals over the next two seasons.